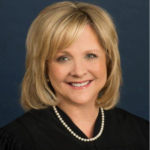 Judge Hockett presided over the 255th Family District Court in Dallas, Texas for eight years, from 2007 to 2014, hearing complex property cases as well as child custody cases. In addition, she served as presiding judge of the Dallas County family courts from 2012 to 2013 and served on the Dallas County Juvenile Board from 2007 to 2013. Prior to serving on the bench, Judge Hockett accumulated 16 years of family law experience in private practice and as an assistant district attorney representing Child Protective Services in Dallas. During her years in private practice, she dedicated a portion of her practice to collaborative law. Judge Hockett has been board certified in family law by the Texas Board of Legal Specialization since 1996. Lori is passionate about helping families reach the best resolution possible as they face change within their family structure. She has the experience, skills, temperament and energy to lead families towards their own resolution. Lori is professional, dedicated and fully engaged in the process. She has the experience to impart a clear understanding to the clients what damage, both financially and emotionally, litigation can cause families with no clear resolution of their individual problems. Lori’s purpose and calling is to guide families to the most cost effective resolution as well as best results for each family member as they move through this difficult process.